I like to draw a distinction between instructing and teaching. For me instructing is just about cuing poses in a sequence. Teaching yoga is about using the poses to challenge and stimulate peoples minds and leave them questioning. There are many rewards but for me the best is when students gain a breakthrough either in their practise or in their lives that they attribute to yoga – for me that is what its all about; assisting personal growth. The most challenging is getting up in front of class and delivering no matter what the day has been like or how I am feeling. ‘Getting over myself to be there for the students’ as I was told in teacher training. The greatest challenge I have had is dealing with depression. It was on retreat for my teacher training that I had a breakthrough into the root cause which allowed me to recover. Yoga allows me to become more aware of my reactions and patterns when it comes to dealing with the challenges of being a parent of teenagers, and practise helps relieve stress that builds through the day to day living. It is a time for myself where I can recharge and rebalance to be more effective in my parenting. What else do you do in life, aside from yoga? I am a practising anaesthetist. I enjoy reading especially around philosophy, psychology and spirituality. I am a bit of an astrology buff and am into dream analysis. I enjoy country drives in my British TVR especially meeting up with Sue for a nice coffee. Half pigeon (Eka Padakapotasana). It is the first yoga pose I ever did and the pose that introduced me to yoga. Whenever I go into half pigeon I feel like I am coming “home”. It is also a pose that combines intense physical activation with the opportunity to turn the senses inward and study the deeper self. It is a great pose towards the end of a practice as it releases the hips that have worked hard in the standing poses and allows you to really look inwards at yourself and consider what has come up in your practise for you. Handstand. It physically challenges me due to the intense shoulder stabilisation and core activation needed. Mentally; it is the challenge of being upside down and being comfortable with that. During my last retreat I managed to hold one for five seconds so I know it can be done and it confirms that anything is possible! I would like to teach more classes and be involved in workshops and training other teachers. On a personal level, I would like to continue deepening my own practise and understanding of yoga. I try to balance working with teaching and practising yoga. I like Asian flavours in my food and red wine in my glass. Coffee is something I over indulge in. Jam berliner: gooey and soft on the inside. You are capable of so much more than you think you are! Divert the money spent on weapons and drugs to assist in food production. There is nothing the matter with reality – the problem is within me and I can deal with me. I like alternative indie rock music! 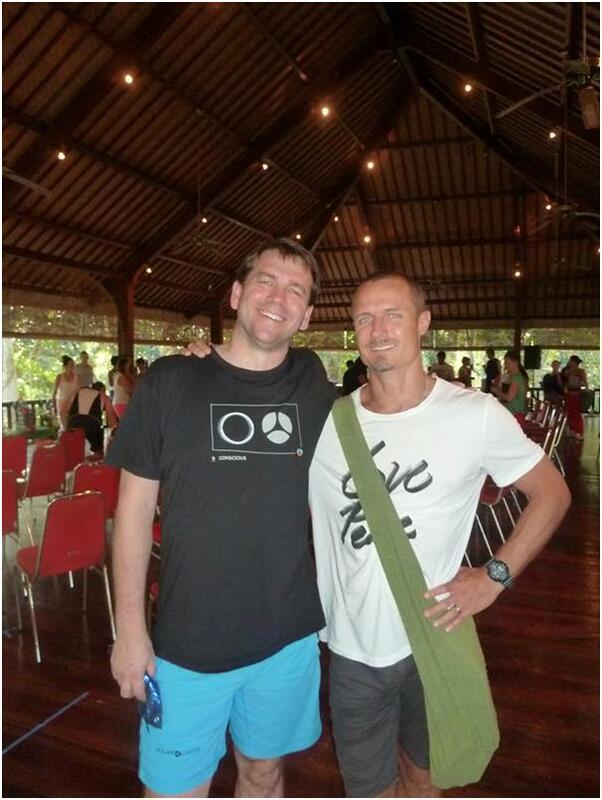 Andrew with Powerliving facilitator and mentor, Keenan Crisp. Great questions! I like the balance between positive life forces and challenges. We all have challenges, but sometimes there is pressure to hide these from the world. Sometimes this impedes self awareness and growth. Hi Tammy, agreed there is a pressure to hide our challenges from the world and there is a perception that we are strong if we do hide. But real strength is showing your humanness. “Be The change”.